i-Series Plus incorporates the technology developed for the Prominence (LC-20A) series, and provides a high level of basic performance with improved ease-of-use. The column oven comes with a larger adjustable temperature range, allowing high-temperature analysis to be performed with ease, while all i-Series Plus models include the automated pretreatment function as standard for sample dilution and co-injection with internal standard substances. i-Series Plus will not only improve analysis throughput, but will also automate human work for improved operational efficiency. The i-Series Plus column oven has a maximum temperature setting of 90°C. Using mannitol analysis as an example, the US Pharmacopeia method notes to control temperature at 85°C for analysis. i-Series Plus can be equipped with a 300 mm long column, and can easily accommodate high-temperature analysis with this column. All i-Series Plus models now come with an automatic pretreatment function. By simply entering items on a template, the automatic pretreatment function can perform operations such as automatic sample dilution, reagent addition, and sample co-injection with an internal standard substance. Since all pretreatment operations are performed by the system, stable results can even be obtained by users unfamiliar with the process, and samples can be analyzed over the weekend or at night without needing human supervision, which promises to achieve substantial improvements in operational efficiency. The dilution function can dilute a sample to a specific dilution ratio. 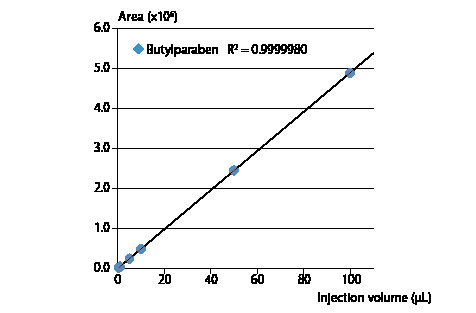 As an example, the dilution function can be used to automatically create a calibration curve by simply placing a standard stock sample solution in the autosampler and specifying the desired dilution ratio. 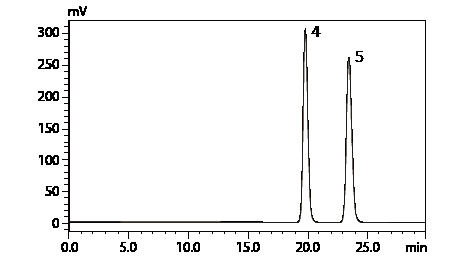 It can also be used to analyze unknown samples consecutively, and output reports containing the quantitation results. 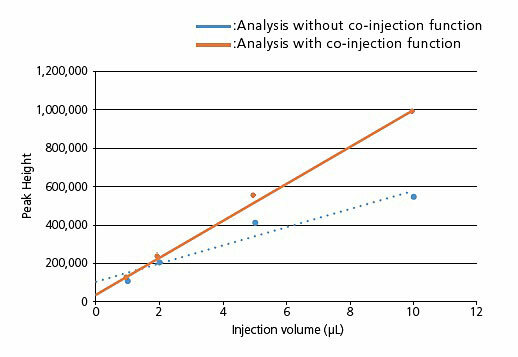 The co-injection function prevents peak shape degradation by co-injecting the sample and diluted solution together. 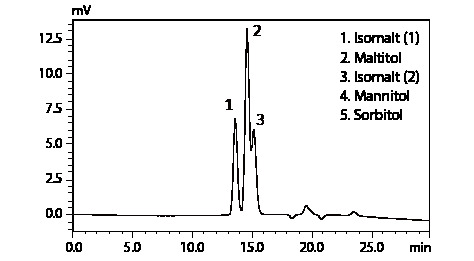 As an example, when the sample solvent is a high-concentration organic solvent, the injection volume can affect the sample solvent and lead to a degradation of peak shape. In these situations, co-injecting the sample and diluting solvent together can prevent peak shape degradation. This problem is more pronounced the smaller the internal diameter of piping used in the UHPLC system, but the co-injection function allows analysis to be performed without replacing piping. 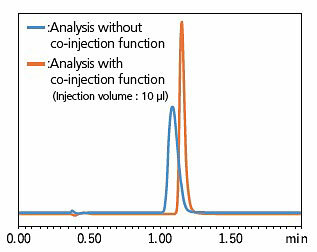 Using the co-injection function allows a sample to be reacted with reagent within the injection needle. 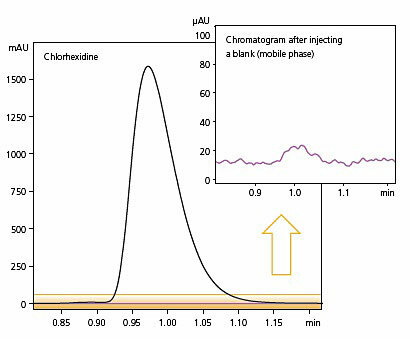 The chromatogram below shows the results of using the co-injection function to perform a pre-labeling reaction with amino acid OPA reagent. The entire aspirated sample is delivered for analysis, reducing the sample and reagent volumes required by analysis to a minimum and also allowing for a highly sensitive analysis. In addition to the temperature control function in flow cells, the i-Series Plus employs new temperature control technology for detector optical systems, known as TC-Optics (Temperature Controlled Optics). 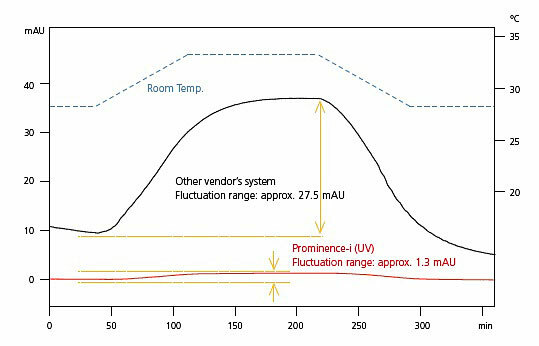 Measurement with a stable baseline, hardly affected by room temperature fluctuation, ensures high precision of validation and quantitation tests on trace components. The i-Series Plus provides highly precise data in micro volume injections of 1 μL or less. This system allows the direct injection of the concentrated samples without dilution to save the preprocessing operation. In addition, the superior injection volume linearity improves the reliability of data for a wide range of injection volumes. Due to Shimadzu's proprietary flow channel design, carryover effects from residual samples are reduced to nearly zero. The carryover specification has been improved to 0.0025%, thereby providing highly precise quantitative performance when analyzing a complex sample. In addition to its reproducible performance on a single system, the i-Series Plus's excellent system-to-system reproducibility further improves data reliability. 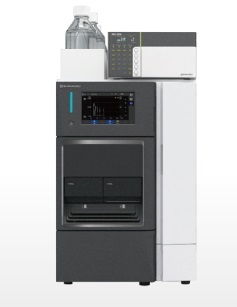 With its unsurpassed performance in areas such as solvent delivery precision, concentration accuracy, and injection volume accuracy, the i-Series Plus is now a new industry standard for global labs.